The Apple iPhone 5 has been available in many regions now for just over a month, and the device has been well received by many owners of the handset. There have been a few issues with the smartphone though, but these are mainly down to early software glitches, and we are now looking at O2 Recycle vs Mazuma Mobile for anyone looking to sell a 32GB iPhone 5. Apple launched the iPhone 5 as the slimmest and lightest iPhone to date measuring only 7.6mm thick and weighing 112 grams, and for the first time on the smartphone increased the screen size up to 4-inches. This while being bigger than previous models of the smartphone may still fall short in some user’s eyes despite the Apple advertising campaign suggesting the display is the ideal size when in use. The company also upped the speed of the iPhone 5 with the A6 processor offering twice the speed as its predecessor, but like any new piece of tech owners can quickly decide it’s not for them. So if you have gone past the time that some retailers or carriers allow for changing your mind and you want to sell your iPhone 5, there a variety of options open to you. Obviously if you are tied into a new two year contract things are not that simple, but if you own an iPhone 5 that isn’t tied to a specific carrier you have a number of options available. 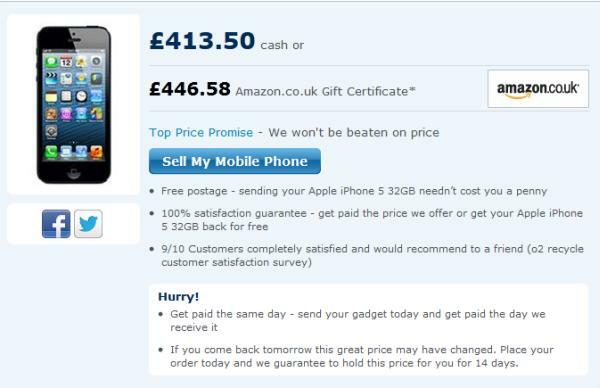 Popular smartphone trade in website Mazuma will currently give you Â£395 for your 32GB iPhone 5, or you can get Â£434.50 with an Argos voucher. This compares to the O2 Recycle program that at the time of writing will pay you Â£413.50 in cash for your handset, or Â£446.58 in an Amazon Gift Certificate. You could always try one of the popular auction sites available though, which may see you getting even more if your iPhone 5 is in perfect condition and not tied to a carrier. As we reported a couple of days ago there seems to be a bit of a wait for the iPhone 5 when buying unlocked versions, and considering the 32GB version of the handset is currently selling for Â£599 on the Apple website may mean you getting more than O2 or Mazuma will offer you. Are you thinking of selling your iPhone 5?